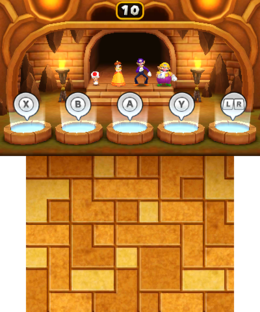 Diamond a Dozen (known as Diamond Drop in PAL reigons) is a General minigame from Mario Party: Island Tour. The name is a pun on "Dime a dozen", which describes something that's common. The camera pans to the bottom of the temple area with a statement that reads "Collect the most ♦'s!". Soon after, the camera moves upward and the players must keep track of which hole has the most diamonds (which can be tricky because the camera moves upward, not downward). The players must then quickly hit the correct button of the hole that they think has the most diamonds. The player who collects the most diamonds wins. Rules – NTSC "Guess which tunnel contains the most gems, and then select it before your opponents can." Rules – PAL "Remember which hole has the most gems in it, and be the quickest to choose it!" This page was last edited on September 1, 2018, at 22:29.